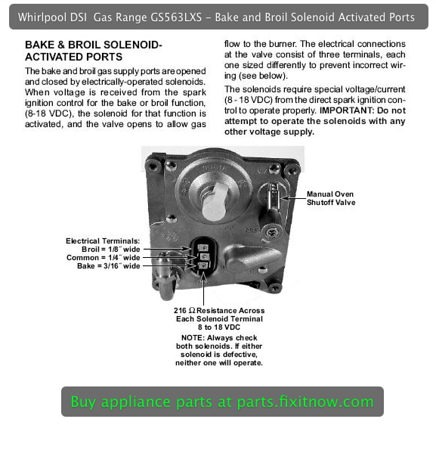 I’ve posted several troubleshooting tips in the past on Whirlpool’s finicky and temperamental Direct Spark Ignition (DSI) gas range (see this page). This one is a special case no-ignition case where you’ve ruled out the other possible causes that I’ve posted about previously and even replaced the DSI spark board in a desperate but blind attempt to solve the problem. Wellll, you just grab o’ them squishy lumps below your spine and come romp with with the Samurai on another DSI range repair adventure! First thing, check for 120vac coming out of the ERC (the electronic range control, aka “clock,” also called an oven control board) and into the new DSI board at the Bake J1-6 or Broil J1-7 harness connectors. Both coils on the gas valve have to have continuity or it will not work. The DSI control checks this before it does a function. Also note that these coils are LOW VOLTAGE DC 8 to 18 VDC. This entry was posted in Oven Repair, Range Repair on December 7, 2010 by Samurai Appliance Repair Man.